I am on a Dave Ramsey kick right now, so here’s another review of one of his products and a giveaway! 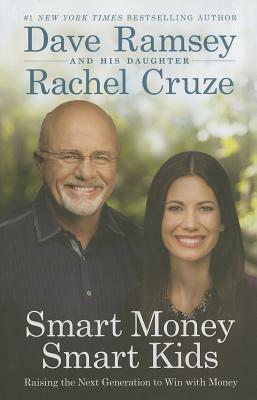 This time the product is the book he wrote with his daughter Rachel Cruze. It’s called Smart Money Smart Kids. Here’s a cute video that Rachel did to celebrate the fact that the book hit #1 on the New York Times bestseller list. If you have ever wondered how to teach your kids about money, this is the book for you! By reading this book, you will be able to mentor your kids in managing money. They will then make most of their money mistakes as youth and will make fewer money mistakes as adults! Reading this book is like sitting down with a multimillionaire, which is what Dave is, and hearing him tell you everything he knows about raising kids to be smart with money. You also get to hear from Rachel tell her story about what it was like to grow up under Dave’s mentorship. What does that look like? It looks like having a “commission” instead of an allowance. A commission is something a kid earns from doing chores, an allowance is just given to a kid, just for existing. It means being given a vision that you can, as a kid, earn enough money to buy a decent, used car when you are 16. It means being encouraged to have a part-time job when you are a teen so that you can earn the car. I absolutely loved reading the stories of each of the Ramsey kids earning money to buy a car the day he or she turned 16. The youngest one earned the most, an amazing amount. What he did with the leftover amount of money after he bought the car was so heartwarming and totally unselfish. I won’t spoil the story for you, but it was so amazing! I wish I had known about this book last summer! That’s when two of teenaged kids earned a pile of cash by working on a farm. But by December, my second son had spent all the money. Now he’s earning money again, having sold grapefruit and doing various odd jobs for people in our religious congregation. I’m determined to help him save some of this money by helping him set a budget every month and divide all his earnings into give, save, and spend, which is one thing Dave and Rachel teach in the book. Most of my questions about what to do about kids and money have been answered by reading this book. I give the book 4 out of 5 stars. That’s because not all of my questions were answered. The main one is, “Just how do you go about finding jobs for your kids to earn money?” In the book, Rachel tells the story of a little boy who was 6 who got the big dream to buy an iPad. He earned the money in “creative ways” she says, so that he accomplished his dream, but she doesn’t go into details. That’s exactly what I want to know! When you are an average middle-class parent, not Dave Ramsey, and don’t have deep pockets or a business with work begging to be done, just how do you help your little kid find jobs away from home to earn more money than he/she can earn at home working for you? I wish this book had a chapter devoted just for that. It does have chapters on teaching kids to work in general (not much details), save, spend, and give, avoid debt, and how to save for college and budget for a wedding. I thought it was cool how Rachel recalls memories of her parents paying tithing and offerings at church, which gave her the example to pay them. I loved learning the five goals, or Five Foundations, every teen should have. they are like Dave’s Baby Steps for Teens. They are 1. Emergency Fund, 2. Pay off Debt, 3. Car, 4. College, and 5. Build wealth and give. As an LDS mom, I have another step to add to it, saving for an LDS mission. I would say that fits in between 2 and 3 or is maybe simultaneous with 3. Nevertheless, it’s a great book that will equip you to mentor your child in managing money. It just needs more on how to mentor your child in earning the money in the first place. So what I am saying is that I want the “work” chapter fleshed out more as to how to find jobs or have a separate chapter that goes more in depth of how to find jobs. I look forward to seeing a second edition come out when Rachel is an experienced mother. Right now her daughter is only 1 so she doesn’t really speak from experience on the parent mentor side. That being said, this book totally raised my vision of what children are capable of earning and doing with money! Please enter the random drawing to win a copy of this book by making a comment below about why you want to read the book. The drawing will be held on Memorial Day, Monday May 30, sometime in the afternoon.